Proxicast's universal wide-band Yagi antenna is compatible with all 3G and 4G/LTE/xLTE data services from Verizon Wireless, AT&T Wireless, Sprint, T-Mobile, US Cellular, Bell Mobility, Rogers Wireless, Telus, Sasktel, Telcel, Movistar, Digicel and many other operators. It can also be used with 2.4 GHz Wi-Fi access points as well as 900 MHz radio systems. 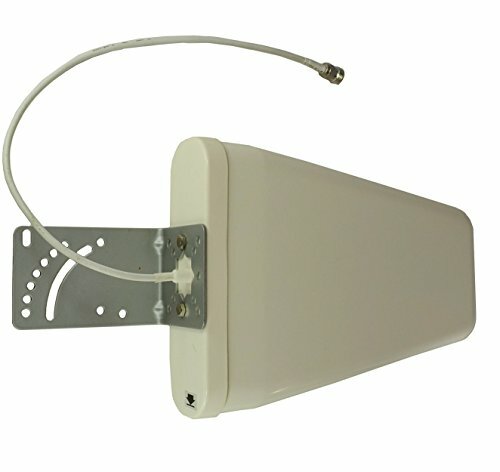 This small, light-weight, easy-to-install directional antenna improves transmit and receive signals across a wide frequency spectrum range and is ideal for many outdoor applications, including building rooftops, utility poles, surveillance trailers, well sites, remote telemetry units, meters, homes and offices. With the appropriate adapter cable (not included), this antenna is compatible with USB cellular modems and Mi-Fi Hotspots, external 3G/4G cellular modems and routers from companies such as CalAmp, Cisco, Cradlepoint, MoFi, Digi, Pepwave, Proxicast, and Sierra Wireless. It is also compatible with most signal booster/amplifiers. Directional antennas must be pointed toward a cell tower. For help locating your nearest tower, consult the OpenSignal or CellReception sites. For MIMO applications mount 2 identical Yagi antennas at a 90 degree angle to each other.